Travis’s victories in the 1900 Metropolitan Golf Association Championship and 1900 U.S. Amateur provided legitimacy and a launching pad for his spirited and prolific journalism. In 1901, Harper & Brothers published Practical Golf, Travis’s first book, which was written with the intent “to diffuse some practical knowledge of the ‘why and wherefore’ of Golf, in order to better assist in working a general improvement in play”. He dedicated his book “to all lovers of the game.” A glowing review of Practical Golf described Travis as a man who has “acquired fine form and copious and correct theory. Thus it comes about that, by virtue of his powers of analysis and of his serious and patient study, he writes of the game better than any other man than Hutchinson, who is the acknowledged dean of the golfing faculty” (New York Times,1901). 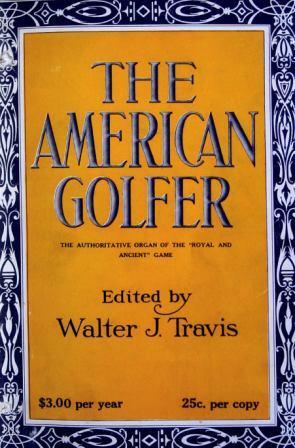 Travis’s most far-reaching contribution to the field of golf journalism was the founding of his magazine, The American Golfer, in November 1908. Under his editorship, the magazine became one of the most respected and influential golf magazines of its time. Arguments presented by Travis on matters such as golf rules, golf equipment, golf competition, etc., often affected decisions made in the halls of the USGA. Travis stayed at the helm of The American Golfer until the spring of 1920 when he sold the magazine and legendary sports writer, Grantland Rice, took over as Editor. At the request of Grantland Rice, Travis wrote a series of ten articles for publication in The American Golfer, titled “Twenty Years of Golf: An Autobiography”. The articles traced his career in amateur golf and ended with the October 9, 1920, article that carried the subtitle, “The Advent of a New Era in Golf Course Construction”. In this article, among other topics, Travis discussed his role in the redesign of Pinehurst #2, and told of encouraging Donald Ross to take up golf course architecture. Though immersed in his career as a golf course designer, Travis continued to write and publish occasionally through the early 1920s. It is believed that his last article was titled, “The Future of Golf”, and published in the March 1924 issue of Golf Illustrated. Travis forecast “the ever-increasing popularity of the game”because “it appeals to human nature of all classes, indeed of all ages, which is not true of any other out-door game”. As Bob Labbance, author of the definitive Travis biography, The Old Man, wrote, “Travis was as much a wordsmith as he was a deadly putter” (Golf Course Design, by Cornish and Hurdzan, 2008).